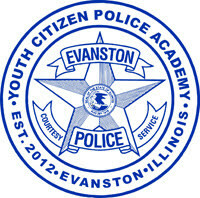 The Evanston Police Department is now accepting applications for the fourth annual Youth Citizen Police Academy, July 13 through 17. The free week-long program gives Evanston residents between the ages of 13 and 17 years the opportunity to learn about the issues affecting law enforcement efforts in the City of Evanston and how to develop a partnership with the police department. Classes and discussions will take place Monday through Friday from 6 p.m. to 8:30 p.m. and are limited to 20 students. The interactive curriculum includes a tour of police headquarters, CSI practices, an overview of SWAT operations, class experiments and exercises in self-defense, and an explanation of use-of-force decision making. Students will also receive a jacket and diploma upon completion of the Academy. The police department is selective in choosing participants due to the need for positive interaction with instructors and other students attending the Academy. However, it should be noted that the Academy is not a boot camp or a program for rebellious teens or youth who have behavioral issues. The deadline to register is Friday, July 10. Download the printable application and drop it off at the Evanston Police Station, 1454 Elmwood Ave., or email it to lspells@cityofevanston.org upon completion. For more information, please contact Academy Coordinator Officer Loyce Spells at 847-859-7843.